Notably successful municipal-level activists: preservationists; anti-development NIMBYs; “complete streets” urbanists. Notably unsuccessful municipal-level activists: anti-gentrification people. Inner cities around the country are blanketed in protected historic districts. Zoning codes have become progressively stricter since WWII, and now make most kinds of disruptive or intensifying development extremely difficult or impossible in most American neighborhoods. Mayors from Seattle to DC to Memphis are tripping over each other to build bike lanes. But American cities are gentrifying faster than they have at any point since activists identified gentrification as an issue in the 70s and 80s. I’m going to claim that this is largely because anti-gentrification activists, speaking broadly, have never formed a coherent theory of what gentrification is or why it happens, and therefore have no idea where in the process to apply pressure. Depending on who you ask, Mark Fishman is either one of Logan Square’s greatest benefactors or the face of unwanted gentrification. Either way, the real estate mogul and owner of M. Fishman & Co. has come to own and manage a lot of Logan Square, and is aiming to own more. Residents of 2536 N. Sawyer Ave., a 50-unit building recently acquired by M. Fishman & Co., have launched a Facebook page protesting what they call an unfair mass eviction. Though it appears M. Fishman Co. has lawfully given residents proper notice that they must leave or pay more — 30 days for month-to-month renters, or 30 days before leases are up — occupants say the tactics are heartless at best. “The scenario is painfully familiar: A developer eyes an opportunity, and in the drive to cash in causes trauma, homelessness, and illness,” reads the page’s “About” section. This scenario is, in fact, a painfully familiar narrative about gentrification: a greedy developer comes in and raises rents, displacing old residents in the process. It has a corollary, which is the culturally insensitive young professional who is willing to pay that newly-raised rent and thereby displace old residents as a result of his or her insensitivity. Both of these narratives – which absolutely dominate the left’s conversations about gentrification – explain the process by pointing to ethically questionable individuals and their individual decisions. That is how we come to have an article about gentrification in Logan Square that revolves entirely around a single storefront real estate business. That might be plausible if gentrification happened in patchy, isolated neighborhoods in a few places where such malefactors happened to congregate. But clearly, that’s not the case. 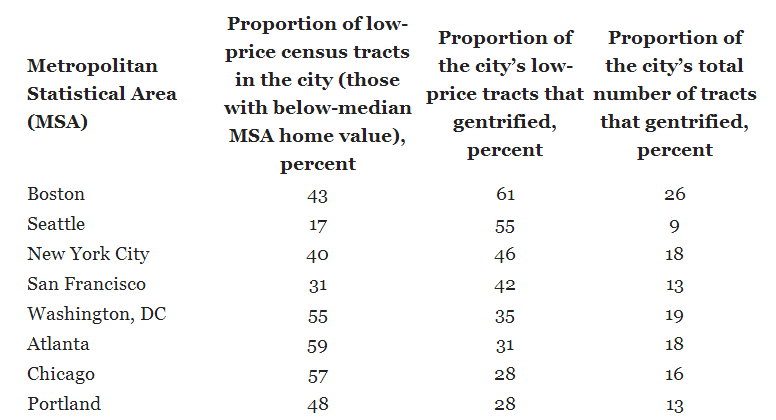 First, look at those numbers – especially the middle column – and bask in the abject failure of the anti-gentrification movement. Second, consider that when between a quarter and half of all eligible neighborhoods are gentrifying in cities all over the country in the course of a single decade, we’re not talking about the actions of individuals. We’re talking about something systemic. Specifically, we’re talking about capitalism. For all of our rhetorical confusion, housing is mostly treated as a commodity in this country. Its price is set by the market. For whatever reason – a cultural return to urban living, falling crime, the cycles of capital investment, etc. – people with money are increasingly moving to urban cores. In most places, the supply of housing has not changed radically. Therefore, rents have gone up. Furthermore, at this point, living close to a major American downtown is probably the best way to gain access to amenities like jobs, restaurants, and, increasingly, good schools. There’s no obvious way to convince people who have the choice to turn that proposition down. There’s no obvious way to convince developers or landlords who can make boatloads of money off of this reality not to do so. More importantly, this is how the system is supposed to work. People are supposed to move where they would like to live. People are supposed to make money where they see an opportunity. Within the framework of capitalism as we know it, there is no way to tell yuppies they can’t move to working-class neighborhoods, and outside of a very few cities, no way to dictate what prices landlords charge – and certainly not what prices homeowners can sell their homes for – any more than the government sets prices on bread or furniture. And yet this is where anti-gentrifiers have decided to make their stand: trying to guilt people into doing something which is clearly not in their interests, and which the government clearly has no ability to compel them to do. This is a recipe for exactly the kind of disastrous losses the anti-gentrification movement has been experiencing from the beginning. Contrast this with the other local movements I listed above: preservationists and NIMBYs have a relatively straightforward goal, which is to prevent new development, a request which is absolutely within local governments’ powers of land use, dating back to the early 20th century. Urbanists’ demands that streets be reconfigured to accommodate cyclists and pedestrians are, again, well within the understood powers of local government. Anti-gentrifiers, on the other hand, are fighting the fundamental laws of capitalism by attacking Mark Fishman. But if we understand gentrification as a systemic process, rather than the result of decisions made by bad people, then it seems that we have two options for fighting it. Option One is to remove housing from the arena of capitalism by socializing the management of residential property. As a political program, it certainly has its problems, both on the merits and in its prospects for becoming law, but it’s a totally coherent approach to the problem. And there are activists who champion it, even if they’re pretty marginal at the moment. Option Two is to mitigate the problem of displacement within capitalism. Before getting into that, let’s stipulate a few things: first, although it does happen, the biggest problem of “displacement” in gentrifying neighborhoods is not actually that people who already live in the area have to leave; studies have shown that low-income outmigration rates in gentrifying and non-gentrifying neighborhoods are remarkably similar. The problem is that the type of person who would previously have moved into the neighborhood can no longer afford to do so, and so soon you get an economically segregated community with all of the horrible social and economic inequality that goes with that. What that means is that policies like targeted rent control – which help existing residents but do absolutely nothing for everybody else – aren’t particularly helpful. Second, the government cannot prevent anyone from moving where they want to move. The government cannot prevent people from renovating their buildings with better kitchen appliances or new coats of paint and plaster to make them more attractive living spaces for white collar workers. What that means is that preventing new development – another favorite target of anti-gentrification activists – will accomplish absolutely nothing. If preventing new development were a way to combat gentrification, then historic districts from Lincoln Park in Chicago to the North End in Boston to half of San Francisco would be bastions of affordable housing. They are not. In other words, if gentrifiers want to move to an area, they will move to an area. And if housing is bought and sold on the market – that is, if we have rejected socialization or decided we need an interim strategy – prices will rise accordingly. Subsidized housing programs within the current framework are absolutely dwarfed by the need for cheaper homes, particularly if we consider that in large parts of our most important cities those subsidies would have to go not just to the poor and the working class, but large parts of the middle class as well. Moreover, an enormous proportion of low-income housing is built – by design – in economically segregated low-income neighborhoods, which severely blunts its progressive effects. All of this is why, despite the apparently icky optics of making common cause with the very same developers they currently demonize, one of the key non-socialization reforms anti-gentrifiers need to make is allowing supply to match demand and ease the upward pressure on prices. Like socialization, it is a systemic approach to a systemic problem, and therefore works on the scale needed to really make a difference. Subsidies are still important, of course – prices will never be low enough for some people – but increasing supply might allow them to fall to a point where the number of people who need subsidies is close to the government’s capacity to realistically provide them. The evidence that housing supply restrictions cause higher prices – and more economic segregation – is very strong. And yet because this approach, allowing for increased supply, is so at odds with the primary leftist narratives about gentrification, it encounters pretty massive resistance from anti-gentrification activists. If up to this point we’ve blamed the entire process on developers, how can it be that the solution is to let them build more? The answer, of course, is that the initial theory is totally wrong. Previous Previous post: Does Chicago’s market in high schools work? Next Next post: School Markets, cont. You can blame me & my roommates for Logan Square, and my friends for Pilsen. Back in the early 1990’s a lot of us who were attending art school at Columbia, or the Art Institute, found that we A. either couldn’t afford to live in trendy neighborhoods like Bucktown, Lincoln Park, or B. found the living space we could afford there not to our liking. Plenty of Landlords looking for good middle class tenants in neighborhoods that couldn’t draw the employed middle class renters turn to slightly lowering rents for college students. We stayed after we graduated, became active in the communities, crime went down, things got better and businesses opened to cater to us. You sound like a terrible person, Vincent. Very interesting analysis! You might be interested to know that the Logan Square Socialist organization (part of the ISO) is behind the effort to stop the M. Fishman evictions. I was at the Thursday picket and my take is that activism can be NIMBY and systemic at the same time–especially when NIMBYs are getting evicted in the middle of the Chicago winter. Hit me up if you want to chat! You make some good points here, but your ultimate conclusions are too glib and uncomplicated to make a lot of sense in the long run. For one, space matters. Space within cities is limited, even more so in specific neighborhoods. Land anywhere in the city costs a lot of money, especially in these gentrifying neighborhoos. Re-development even more so. No developer will even begin to tackle this kind of project unless they are well-assured that they will a return on their investment. Base-level condo prices will fall in line, matching comparable prices (the gentrified prices) in the neighborhood. When that investment stops returning profit – for instance, when supply outweighs demand and prices begin to level or drop – developers stop developing. In time, demand increases again (because space is limited), they start developing again (only with a more expensive base this time) and prices rise once more. This could go on forever. And what was initially attractive about a particular neighborhood will slowly disappear. All that said, maybe you’re right and we shouldn’t be so sacred about these things – history, established neighborhood character, preservation, etc. The lack of “qualms” is surely what allowed cities to develop so quickly and fluidly, for all economic classes, at the beginning of the 20th century. Maybe when we reach the city boundaries, or the neighborhood boundaries, and we’re forced to stop expanding sideways, we should just expand up. I’ve been reading through your blog some more tonight and I’d like to apologize for my reaction to this post, which I admittedly read and responded to a bit too hastily. What I would retain of my previous comment, ultimately, is that I am genuinely curious to see examples of new development in already gentrified neighborhoods that allow for lower income residents to “breech” those neighborhoods. Or once gentrified, are these areas past the point of no return? It seems that all new development within gentrifying neighborhoods in Chicago is squarely targeted at the gentrifiers, in terms of housing size, style, amenities and therefore price point; so it’s hard for me to imagine what form a lower income development might take. I understand that just extending supply would help to satiate and balance demand, at least curbing prices a bit, but ultimately developers won’t develop unless they see a profit to be made, and I wonder sincerely what that kind of model would look like for lower income, non-subsidized housing. No problem. You make a good point, which is that new-build homes are almost never going to be targeted at the truly low-income – the cost of building is just too much for low-income people to be able to afford. That said, in many places, the cost of new construction is so high that a large chunk of middle-class people would be able to afford new construction in the absence of strict zoning. In Houston, for example, halving the required square footage of land per home is estimated to reduce new-build home prices by something on the order of $100,000. That’s a big deal. The other thing is that building new homes in already-gentrified areas gives higher-income people elsewhere to buy, reducing pressure on older, smaller units that might not have all the amenities of the new ones. I think also that part of the answer has to be some combination of subsidized housing and increasing wages on the low end. There’s just no way that the market is going to be able to provide affordable housing for everyone in decent neighborhoods, for all the reasons you list. Taking housing out of the speculative market has been a tactic of affordable housing advocates for a long time. It can be done with limited equity, deed restricted coops. It probably works better with non-profit/public rentals, assuming there are controls to maintain the long term affordability. In Canada, they call this “social housing.” The big problem is taking it to a scale where it makes a meaningful impact in a neighborhood, let alone a large city. I think it’s correct that this will primary involve buying existing units, rather than building new ones. San Francisco is starting to buy apartment buildings for affordable housing, though at a hellacious price. Obviously it would be cheaper in Chicago. An article in Forbes, of all places, pointed out some limitations of the just build it strategy. For many reasons, new development in cities has been concentrated in a few neighborhoods, not evenly spread across all the places it’s permitted. Allowing greater density just might intensify the gold rush in favored places. To me this argues for a more nuanced supply strategy. To stimulate broad–based construction, a city should focus on increasing the supply in neighborhoods that are on the financial edge of developability. That would help spread the benefits of neighborhood reinvestment while mitigating the impacts.